Is it possible to live without burning fossil fuels? 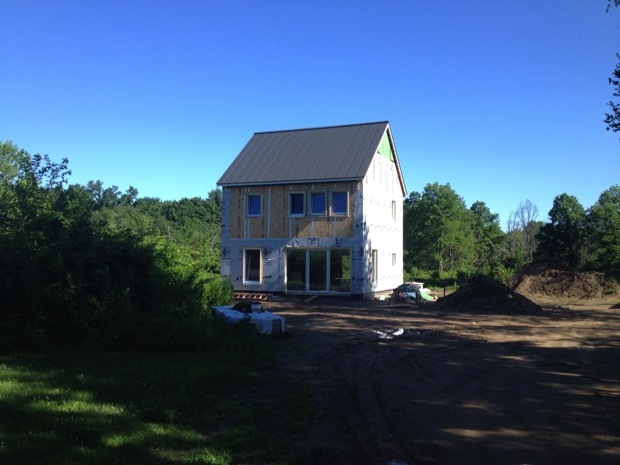 We are attempting to build a zero energy house, fully powered by the sun and following Passivhaus design guidelines, to answer that question. 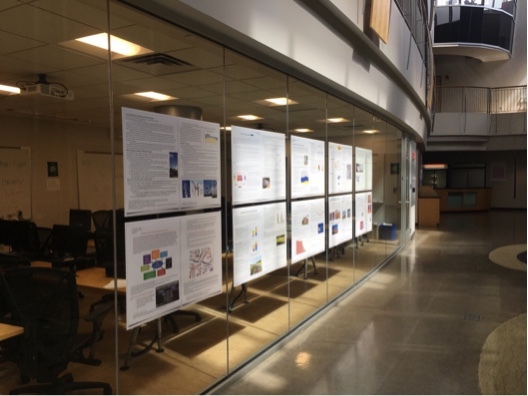 In keeping with Mount Holyoke College’s Sustainability Initiative, our final projects in Phys/Envst 104 this year focussed on raising awareness about planning for energy self-sufficiency in order to enable the college to disconnect from the electricity grid. 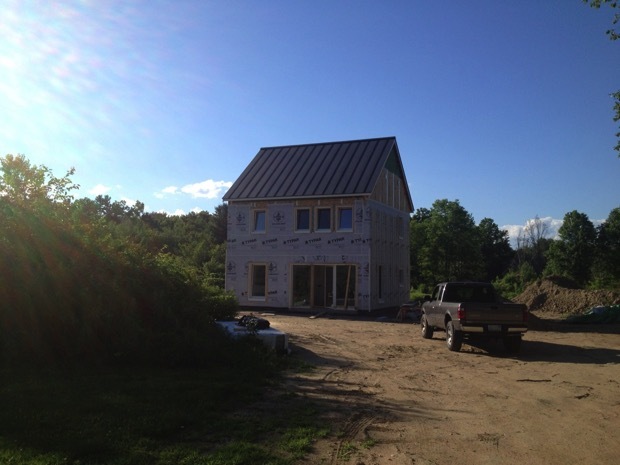 Why are we thinking about going off-grid when most people are just now hearing about the whole net zero concept? Consider that within five years, battery and solar costs will have fallen to such an extent that going off-grid will be cheaper and more reliable than staying on the grid. There is a real possibility of a utility death spiral that will threaten the reliability of the grid for everyone. Now is the time for us to begin planning for energy self-sufficiency, especially as extreme weather, intermittent renewables, and grid hackers increasingly challenge the integrity of the grid. 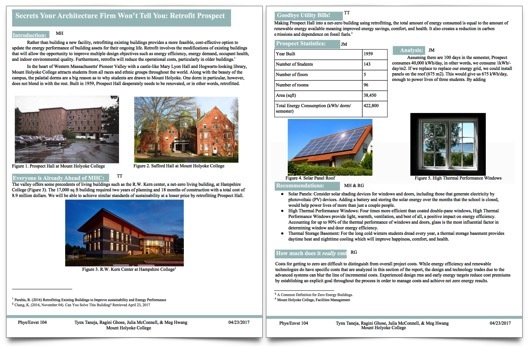 Download these eleven high resolution Factsheets and learn what you need to know to help take Mount Holyoke College off the grid! When people arrive at Mount Holyoke College they immediately remark upon the beautiful old buildings surrounding Skinner Green. The aging structures are even more apparent to the students who live in them, for they are constantly reminded of the thin walls and drafty windows. The buildings clearly lack sufficient thermal insulation, the most important aspect of energy conservation. Thermal insulation plays an important role in energy conservation, as the majority of energy waste is found in heat loss. 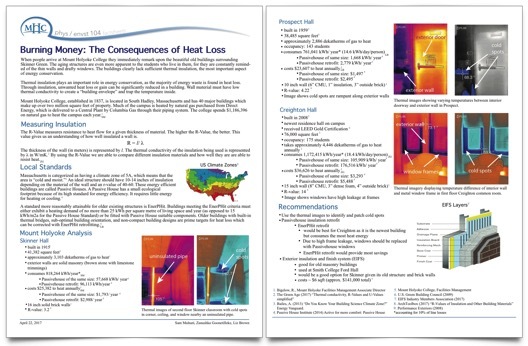 Through insulation, unwanted heat loss or gain can be significantly reduced in a building. 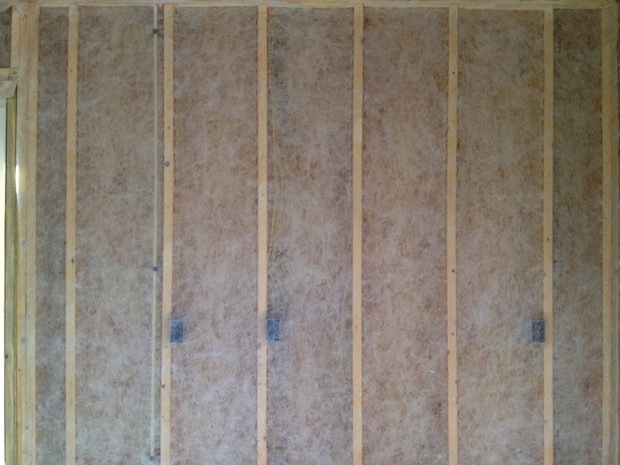 Wall material must have low thermal conductivity to create a “building envelope” and trap the temperature inside. Mount Holyoke College, established in 1837, is located in South Hadley, Massachusetts and has 40 major buildings which make up over two million square feet of property. Much of the campus is heated by natural gas purchased from Direct Energy, which is delivered to a Central Plant by Columbia Gas through their piping system. The college spends $1,186,396 on natural gas to heat the campus each year. How would you like to spend your winters studying by candlelight in a cold and dark library? Well, this will be your future unless a proper system of energy storage is implemented. Imagine a day when we finally transition to renewable energy sources at Mount Holyoke College, yet we have no way to store it. In the summer solar panels will bring in all of the energy you could ask for and more, but come winter when the sun is scarce, generating sufficient energy will be a challenge. Next, imagine a scenario where there was a methane leak from natural gas storage and we were confronted with a full-fledged power outage on campus. These situations could be avoided if we implemented an effective storage method. With Super Blanch close to completion, Mount Holyoke is facing a lack of creativity in implementing initiatives to utilize large indoor spaces where dining halls currently are. To combat the loss of on-campus work-study dining staff jobs, and to put these gutted spaces to use in a green campus initiative, we propose that the Prospect Dining Hall be repurposed into an indoor greenhouse. Maintaining this space will resolve the issue of work-study job loss. Building the greenhouse and community surrounding it will be a job for Residential Life staff, using this space to generate conversation and student activism in an already-enthused group of residents. By combining sustainability, aesthetic appeal, and educational value, Mount Holyoke College will create a space which will improve the quality of life of students, faculty, and staff. As fossil fuel resources continuously deplete and exacerbate the environment, alternative modes of energy are becoming increasingly necessary. As the most abundant renewable resource, solar has the capability to harness the sun’s energy into a variety of uses, such as heating water and generating electricity. 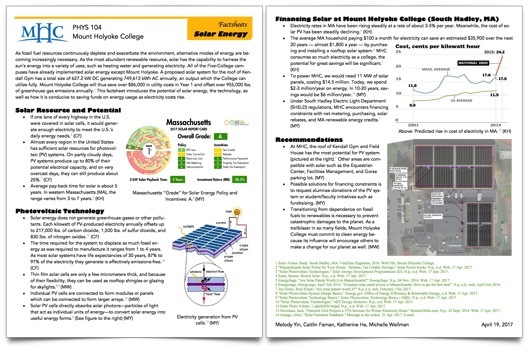 All of the Five-College campuses have already implemented solar energy except Mount Holyoke. A proposed solar system for the roof of Kendall Gym has a total size of 627.2 kW DC generating 749,613 kWh AC annually, an output which the College can utilize fully. Mount Holyoke College will thus save over $86,000 in utility costs in Year 1 and offset over 955,000 lbs. of greenhouse gas emissions annually. 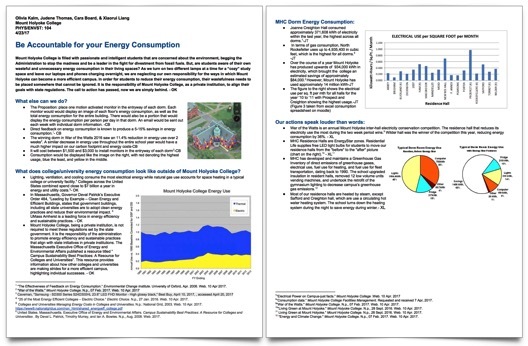 This factsheet introduces the potential of solar energy, the technology, as well as how it is conducive to saving funds on energy usage as electricity costs rise. Our current myopic reliance on fossil fuels has poisoned the planet with Carbon Dioxide. Humanity has reached a point where making dramatic changes is a literal matter of life or death. The Earth cannot sustain our lifestyles without the use of renewable energy. Although solar energy is commonly viewed as the most viable renewable energy option for homeowners and commercial buildings, wind is a plentiful resource that has been widely overlooked and that can supplement solar energy. Whereas fossil fuels are not only a depreciating investment that requires continued labor resources while polluting the air and damaging the landscape, wind turbines function without maintenance and can be installed wherever there is ample space and Class 3 winds, or wind that has an average annual speed of 14.3 to 15.7 mph at 50m. A 2015 study by the U.S. Department of Energy found that wind could provide 20% of U.S. electricity by 2030 and 35% by 2050 if implemented properly. Wind energy will be a significant force in the responsible energy system of the future. Where does wind fit into Mount Holyoke college’s plan for a sustainable future? Wind provides energy during the winter when MHC solar panels cannot access enough strong light. This saves on battery costs because solar energy does not need to be stored for the winter while wind energy is generated spontaneously. Wind turbines can also be placed on flat, vacant rooftops that are not compatible with solar panels. 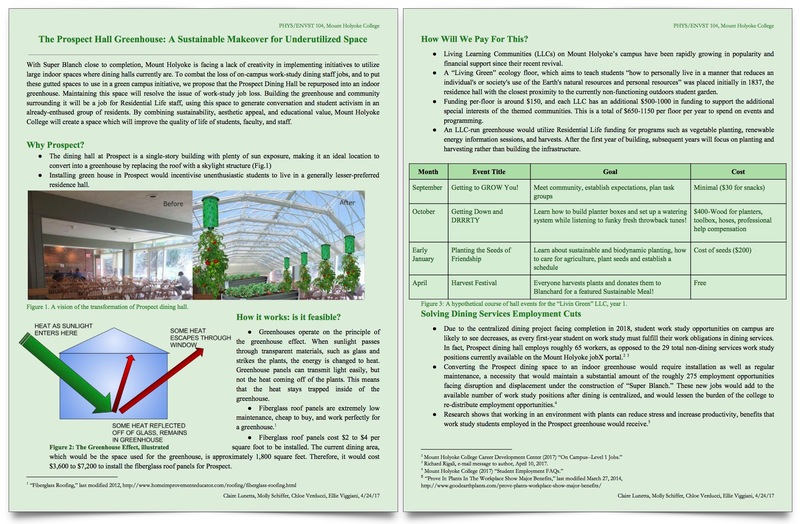 Is your building LEED Certified? Does it still consume a ton of energy throughout the day? Would you like to decrease the energy use, yet increase the comfort levels? 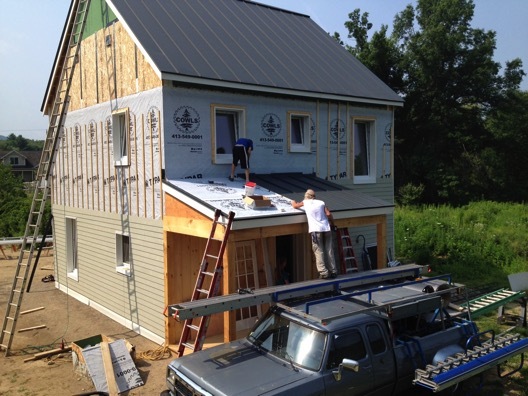 If you answered yes to one or more of these questions, Passive House is right for you! 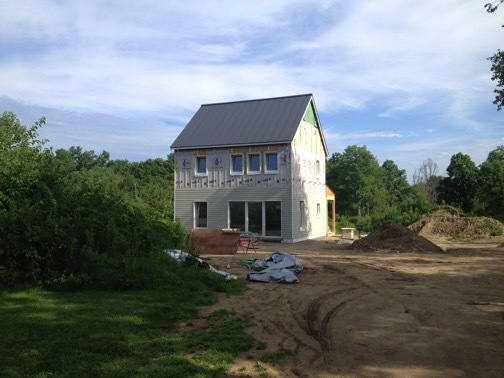 Passivhaus is a building movement first developed in Germany aiming to reduce the ecological footprint of buildings. 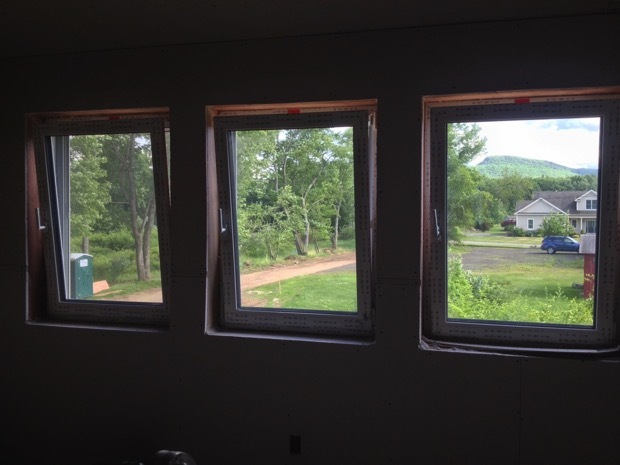 It is a standard for energy efficiency, creating buildings that require little energy for heating or cooling, through several strategies dealing with ventilation and thermal envelopes. Do you know your chances of survival by the time you’re 50? We really need this knowledge for which we urgently need a conference similar to the BOOM conference held earlier this semester. 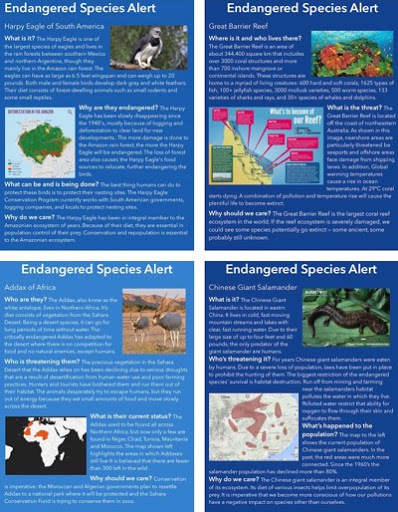 The panels and events will be based around the topics outlined in this fact sheet. Both students and faculty would be invited to present or facilitate panels and discussion. The topics that would be covered should be important and relevant to helping Mount Holyoke students become climate literate. Climate change impacts everyone , no matter what they’re studying, and a conference could be instrumental in increasing climate literacy on campus. Because Mount Holyoke is a diverse and inclusive space, putting an emphasis on the make up of industries that will be responsible for helping to fight these issues with renewable goods and technologies is important. As a community with students from 45 states and 75 countries1 we need to address the ways people in different regions will be affected by climate change differently, and this also serves to help students learn about the regions they may be focusing on in their time here. Fighting climate change requires knowledge of the opposing factors, such as the petroleum industry, and the financial and political ways real change can be hampered. Overall this conference should give students the knowledge and tools they need to be changemakers, no matter what they’re studying, and impart a sense of urgency in finding and fighting for solutions to the problems facing our world. Mount Holyoke College is filled with passionate and intelligent students that are concerned about the environment, begging the Administration to stop the madness and be a leader in the fight for divestment from fossil fuels. But, are students aware of their own wasteful and unnecessary energy consumption in their living spaces? 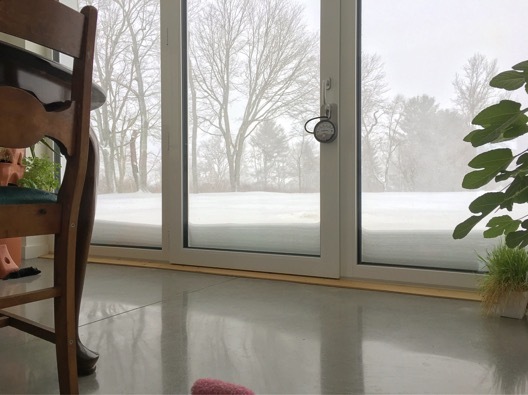 As we turn on two different lamps at a time for a “cozy” study space and leave our laptops and phones charging overnight, we are neglecting our own responsibility for the ways in which Mount Holyoke can become a more efficient campus. In order for students to reduce their energy consumption, their wastefulness needs to be placed somewhere that cannot be ignored. It is the responsibility of Mount Holyoke College, as a private institution, to align their goals with state regulations. The call to action has passed; now we are simply behind. 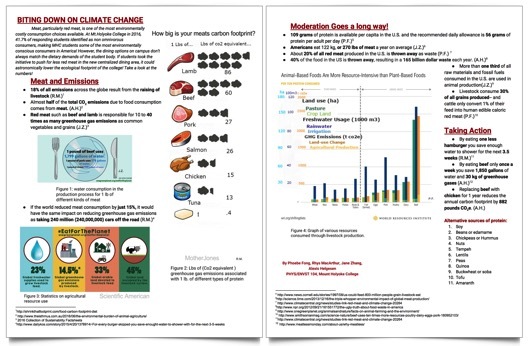 Meat, particularly red meat, is one of the most environmentally costly consumption choices available. At Mt. 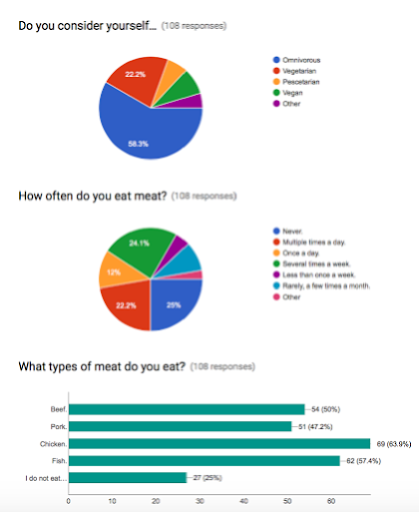 Holyoke College in 2016, 41.7% of responding students identified as non omnivorous consumers, making MHC students some of the most environmentally conscious consumers in America! However, the dining options on campus don’t always match the dietary demands of the student body. 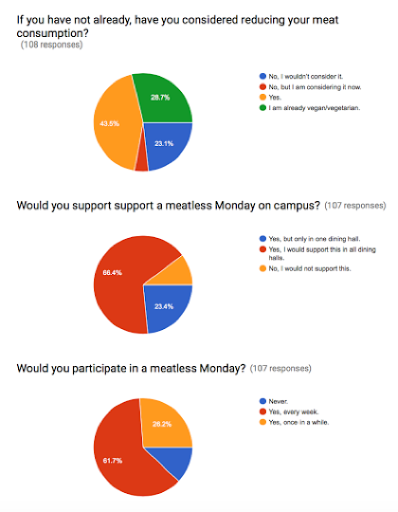 If students took the initiative to push for less red meat in the new centralized dining area, it could astronomically lower the ecological footprint of the college! Take a look at the numbers! The dining halls on campus are spaces that every student at Mount Holyoke experiences frequently. But how many of the students who frequent these dining halls stop and think critically about where the food that they consume comes from? It just magically appears to be prepared by the lovely dining staff for us to enjoy, right? The truth is that a large percentage of our food comes from commercial farms across the country, which means that a great amount of energy is put into bringing that sprig of parsley to MHC so that the chefs can add flavor to those potatoes from Idaho. Commercial farming does not concern itself with the quality of food or the long term impact on the environment that it has. 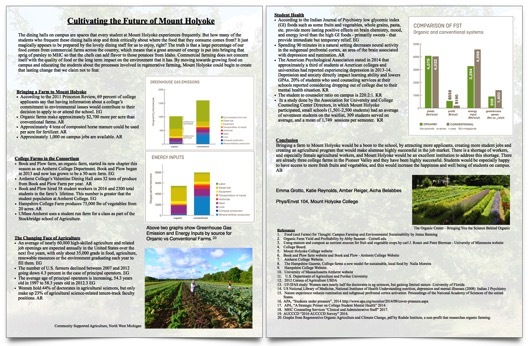 By moving towards growing food on campus and educating the students about the processes involved in regenerative farming, Mount Holyoke could begin to create that lasting change that we claim not to fear. 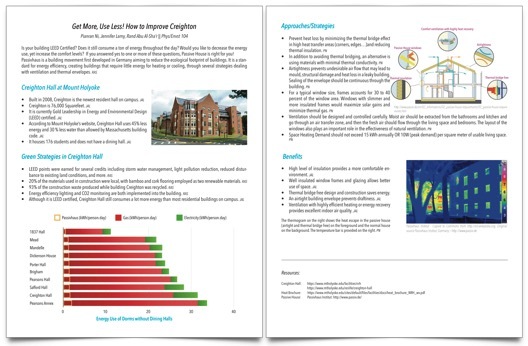 Rather than building a new facility, retrofitting existing buildings provides a more feasible, cost-effective option to update the energy performance of building assets for their ongoing life. 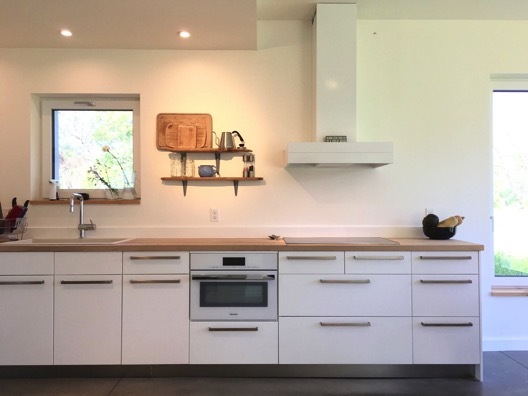 Retrofit involves the modifications of existing buildings that will allow the opportunity to improve multiple design objectives such as energy efficiency, energy demand, occupant health, and indoor environmental quality. Furthermore, retrofits will reduce the operational costs, particularly in older buildings. In the heart of Western Massachusetts' Pioneer Valley with a castle-like Mary Lyon Hall and Hogwarts-looking library, Mount Holyoke College attracts students from all races and ethnic groups throughout the world. Along with the beauty of the campus, the palatial dorms are a big reason as to why students are drawn to Mount Holyoke. One dorm in particular, however, does not blend in with the rest. Built in 1959, Prospect Hall desperately needs to be renovated, or in other words, retrofitted. 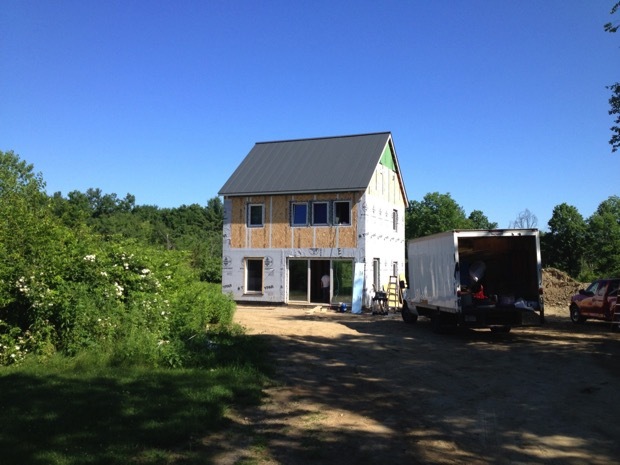 Welcome to the Potwine Passive House, the first certified Passivhaus in Western Massachusetts. Follow along the checklist to make sure you see all of the features of the home. 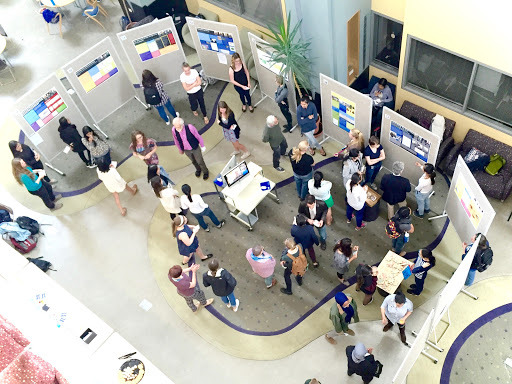 Take a look at some of the amazing projects by the phenomenal students in Phys/Envst 104 this semester. Phys/Envst 104 (Renewable Energy) is a general education science course I teach at Mount Holyoke College. Can I get a plate of solar energy sunny-side up please? The air is stiflingly hot. You realize you can hardly breathe. Your skin feels like it is catching fire. Your alarm wakes you up. produce feelings they were not otherwise feeling. But what if music started to reflect people’s reality. The lyrics and melody becomes a part of the listener so if the lyrics were to inspire change, there would be more initiative towards improving the state of our environment. The 6:30 alarm goes off, and you roll out of bed. In that groggy, barely awake moment, what is the first thing you do? You flip on the lightswitch. This is a simple action that occurs every morning and throughout the day, but hardly ever does the average person give a second thought to what energy source is supplying power to that lightbulb or where that power is coming from. Our project strives to highlight the differences in overall efficiencies of coal power plants and renewable energy sources, including the long term monetary benefits of switching to renewable sources. With current technology, electric cars rely on lithium batteries. 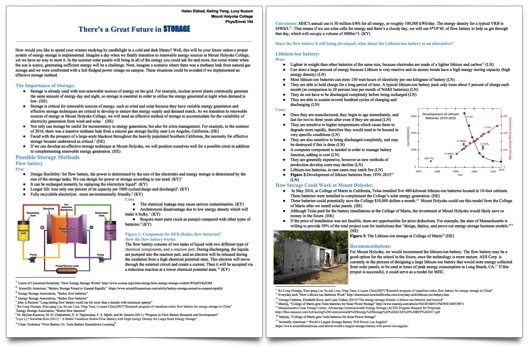 Because lithium batteries are the foundation of the future, it is essential to understand the process of lithium mining and its possible impacts. The purpose of this project is to provide information about the mining process itself, but also to raise concerns and explore political, environmental and economic impacts so that further improvements can be made if necessary. With the climate crisis looming over our heads, it’s easy to quickly point blame at the industrial giants and overlook our own contributions. How much do our seemingly simple day to day actions, down to what we put on our plates, have an impact on our climate? The power to create and ensure a sustainable future comes from a rather unsuspecting place: your plate. The agricultural and food industries are big players in the topic of climate crisis, and what we decide to consume can either drastically help or hurt that. Pigeons scuttling across city sidewalks in the winter wind. Bees and butterflies slowly reviving spring flowers. Crickets singing in the grass on warm summer nights. Squirrels hoarding acorns in the fall. What if one day none of that happened? You’d realize something was wrong, but how late would you be? We, as humans, focus almost entirely on ourselves: how much longer will we have the resources we need? How many more people can the world support? How can we produce, transport, and store enough food? How can we make sure we survive, regardless of the cost? Per capita meat consumption has more than doubled in the past half-century. Linked with global population growth, the overall demand for meat has increased five-fold. The meat industry has put a heavy demand on resources, limiting the availability of water, land, feed, fertilizer, and fuel. American fast food chains have thrived on the novelty of a classic burger. Long lines at the drive- thru highlight consumerism at its finest. However, does each consumer ever think of the environmental footprint that goes into creating that one burger patty? The US experiences the 4th greatest wealth inequality compared to 141 other countries. 578,424 people were reported to live without housing in 2014, and 46.7 million are living in poverty. That’s more that 14% of our population. We have all been told that solar power is going to save us. Solar power can produce upwards of 147kWh/day/person and in an ideal world; solar power would be as commonly used as gas and coal. We decided to break down the financials of installing and using solar power, in order to provide more insight as to whether it's a viable alternative as we combat climate change. 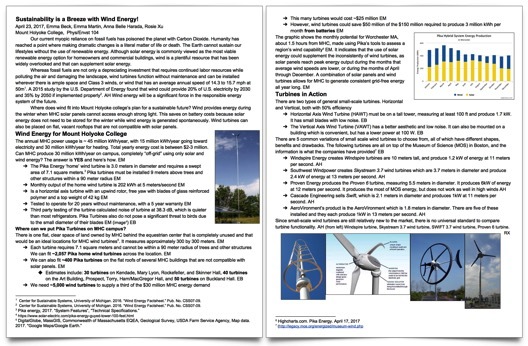 In our curriculum we want to incorporate the knowledge on the four renewable resources and how important it is to replace fossil fuel use with solar or wind energy. We feel it is also important to cover how much we use and waste daily; how efficient our energy usage daily is, and how harmful human impacts on the environment are. We will use a hands-on approach that gets students moving and interacting with these topics, because we feel they will identify more with the issue. We ultimately want to empower the youth to take action because they are instrumental in advocating for change. 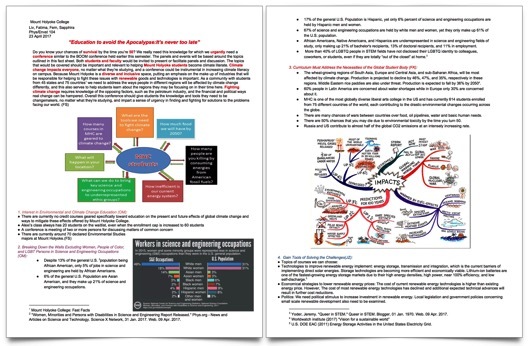 While complicated scientific jargon may make understanding environmental issues seem like an impossible challenge, the truth is that our everyday actions have real, important consequences for the environment, and the mission of this blog is to make climate change concrete. To show the ways in which your actions matter. We will challenge and we will educate. We will put the power of climate justice where it belongs: in your hands. Our current world relies heavily on conventional fossil fuels: coal, natural gas, and oil. We're expected to run out of these energy resources by the end of this century at our current rate of consumption. What will we do for energy next? Before we turn to renewable energies, we might look into more unconventional fossil fuels, one of these being methane hydrates. Most of us give little thought to the act of flipping on a light switch, much less the enormous infrastructure that must go into the vast process of bringing electricity to nearly every corner of our beautiful modern world. And what about the remarkable scientific advancements that brought us from candle light to electrification over the past 100 years? How did that happen? It’s a small dot in the history of humankind, but a time of unparalleled change that revolutionized how we live, think, communicate, treat disease, and interact with the world. Electromagnetism is probably the single-most important scientific advancement in the history of humankind, and we’ll try to understand a bit about it here, at least enough to understand why electricity and magnetism are central to our ability to end our addiction to fossil fuels. Electric cars, the solution to polluted cities, in the 1830’s! Walking through London in the 1830’s, you would have had to use a torch to see where you were going — in the middle of the day. The pollution was so bad that darkness descended on industrial cities, at certain times of the year, as it often does today in some parts of China. But at the time, people were thrilled about a new exciting discovery — the electric motor. Trains, cars and even boats would soon be powered by clean electricity rather than coal. It never happened, of course, because people soon realized that batteries didn’t last forever and were tremendously difficult to keep replacing. Despite this spectacular flop, I’m here to tell you that — this time — it’s going to be different! Why don’t your hands pass through each other? Rub your hands and you can feel the texture of your skin, the soft muscle tissue wrapped over a hard skeleton. The nuclei of the atoms in your hand contain most of the mass — the heavy part — but they are spaced a surprisingly long distance apart. Consider this: if the nucleus was as big as you are, the next nucleus would be a mile away! There’s a tremendous gap of wide open space between every nucleus in your hand, occupied by essentially nothing, except for the occasional electron. The standard picture of atoms packed tightly together, with electrons spinning around the nucleus, is totally wrong. The real picture is one of mostly empty space. Why then can’t one object pass right through the other? Why doesn’t light pass right through the desk in front of you? The answer is: the electrons. Electrons float around in the empty space, sometimes tied to a nucleus, sometimes allowed to roam free. It is the repulsive force between the electrons in your hand, and the electrons in whatever you touch, that gives the sensation of “touch.” You are physically feeling electric repulsion — the collision between electrons that don’t want to mix. 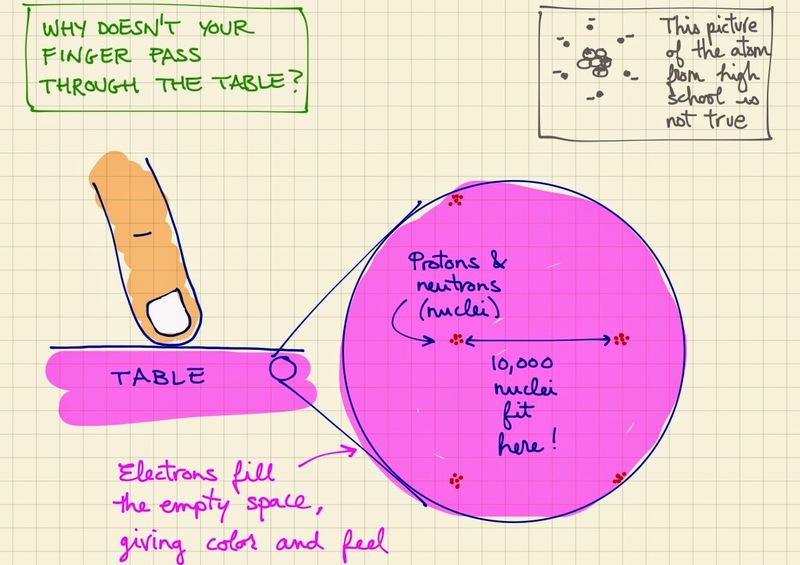 You are physically seeing the collisions between light and the electrons in the table. 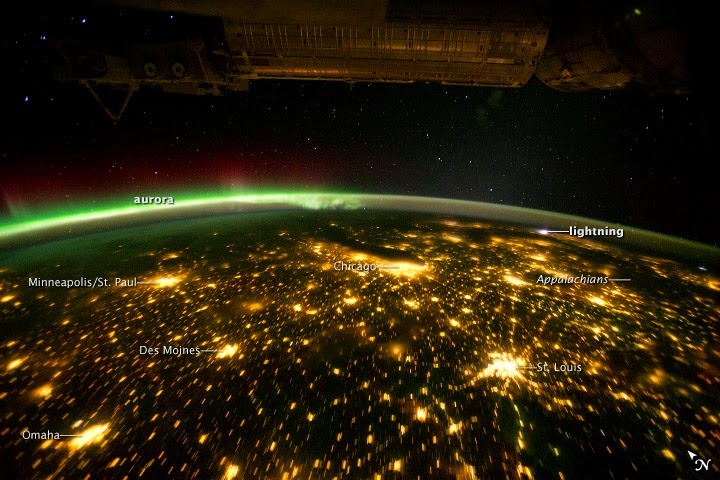 These electric forces are strong, they dominate how we interact with the world, and they can generate spectacular effects like the Aurora and lightning. You might wonder why electrons don’t want to mix. Unfortunately, I can’t answer that one. No scientist can — we just don’t know why. Electrons move extremely slowly. Getting through a wire is tough work. There’s a lot of bumping into the lattice of the nuclei. Electrons move at about one meter per hour — unbelievably slow. How is it, then, that you can Skype across the world in real time? How is it that you can flip the light switch and immediately the lights flick on? Think of a long high speed train packed with people. It’s so tight that no one can move. Now try to push someone in at one end of the back car. The only way to let that person in is if someone else gets off at the other end of the train. The only movement that must occur is for everyone to shift down a bit. The actual movement of the people is slow, yet the response of everyone shifting down a bit can propagate along the train at a much higher speed. Pushing electrons down a wire is how we move energy, almost instantaneously, through wires. Plug your cell phone into the wall, and you can’t start charging until someone starts shoving electrons into the wires at a power plant miles away. It’s amazing. You marveled as a little kid at the amazing forces of attraction and repulsion between two magnets, depending on their orientation. It’s a magical force, invisible yet so strong. For all of the 19th century, while the technology of electricity and magnetism was developing, scientists had no idea what was actually going on. It turns out that magnetism is, in part, also a property of electrons. 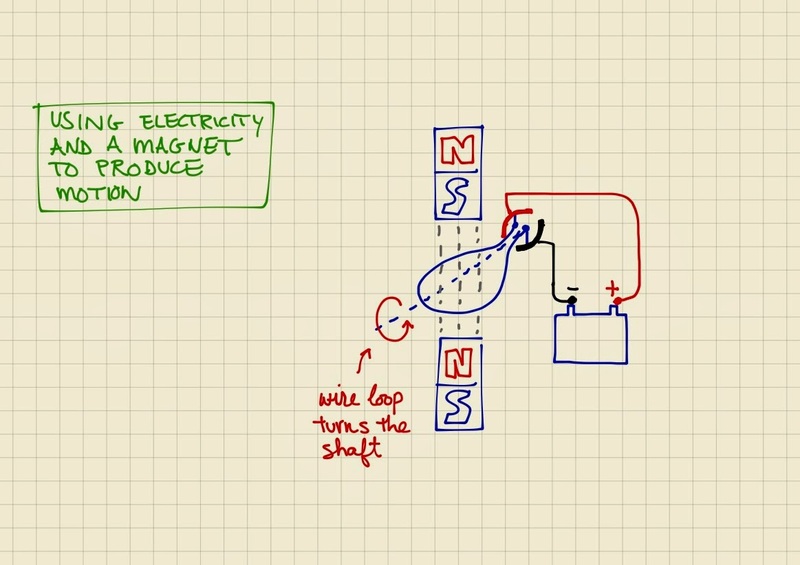 Unlike electric repulsion, however, magnet repulsion has an orientation. The direction in which the electron is pointing determines if the magnetic force is attractive or repulsive. Amazingly, all the electrons in magnetic materials like iron are naturally aligned to point in the same direction. You can think of it as a conspiracy. What is their ultimately goal? No one knows, but I think they are trying to tell us to solve the climate crisis by using the powers of electromagnetism. 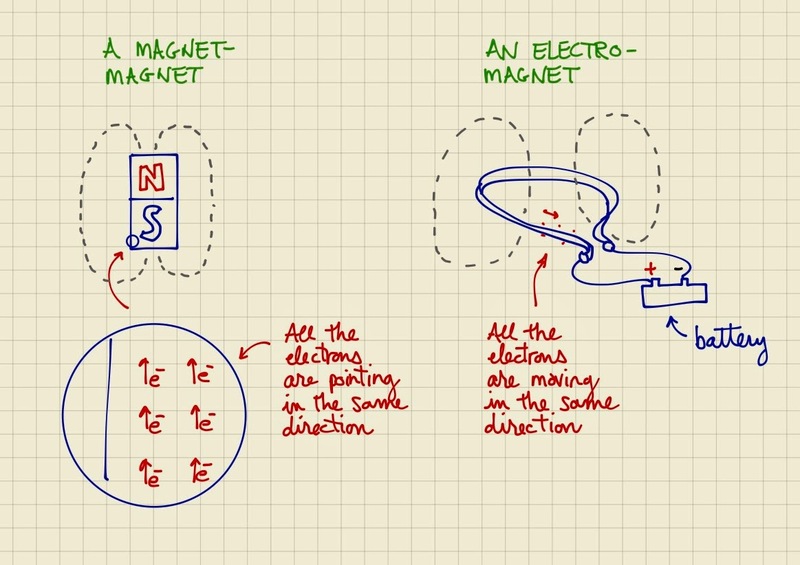 There’s another way to obtain a magnet other than pointing all of the electrons in the same direction. It turns out that running electrons through a wire can also produce a magnet. As the electrons move through the wire, from their perspective, the nuclei in the wire actually contract a little bit, leaving an electric imbalance between the electrons and the nuclei. This contraction is due to the very not-obvious fact that everything that moves actually get squished a tiny amount. You might have heard of Einstein. He figured this out. The strange thing is that this electric imbalance depends on the direction in which the electrons are moving, similar to how the magnetic force depends on the direction the electrons are pointing. In fact, the direction of the force is the same for these two cases, and everything else about the two forces happens to be the same, so we go ahead and call them both magnetic forces. 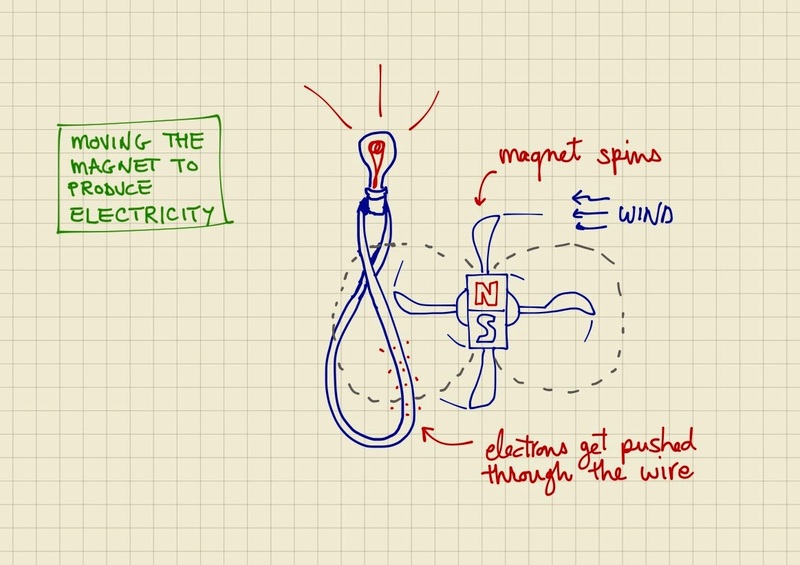 It’s wild, but you can create a magnet by moving electrons through a wire. I realize that things are starting to get pretty weird, but it gets even worse. Not only can you create a magnet by moving electrons through a wire, but you can also create electricity by moving a magnet nearby a wire. Take a wire, and take a magnet. Move the magnet. The electrons in the wire will get pushed through the wire by the magnetic force. Essentially, the electrons are responding to the motion of the magnet by turning themselves into a magnet. You can sit there all day and wiggle the magnet back and forth and you’ll get current wiggling back and forth. And that is basically how electricity is generated. We can also do this in the opposite direction. Take a wire. Run electrons through it. The wire will produce a magnetic force. Place a magnet nearby. The wire-magnet will feel an attraction or repulsion from the magnetic force of the magnet, just like a normal magnet would. What’s amazingly cool is that you can wrap the wire around a shaft and, together with the nearby magnet and electricity, cause the shaft to turn! 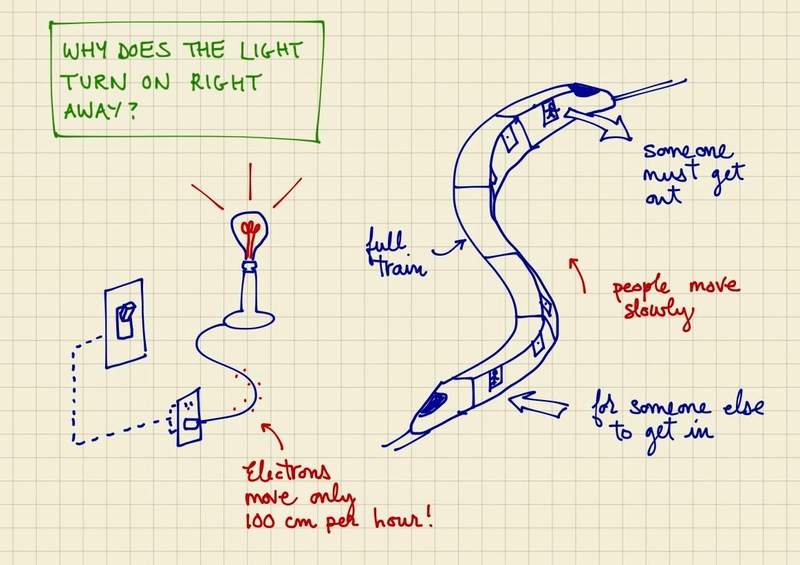 And that is basically how an electric motor works. Weeks 28 through 30 seemed like they were mostly spent killing time while the interior was painted. We needed to get the inside painted before the cabinets could get installed, which needed to come before the sinks could be installed, which in turn needed to come before the plumbers could show up. Since the plumbers and the electricians had to work together to get the water heaters installed, the electricity was also held up. Given that only one guy, Jeff, was available to do the painting, it took forever. I was pulling my hair out the whole time. The progress was painfully slow, but we still managed to have some exciting moments. 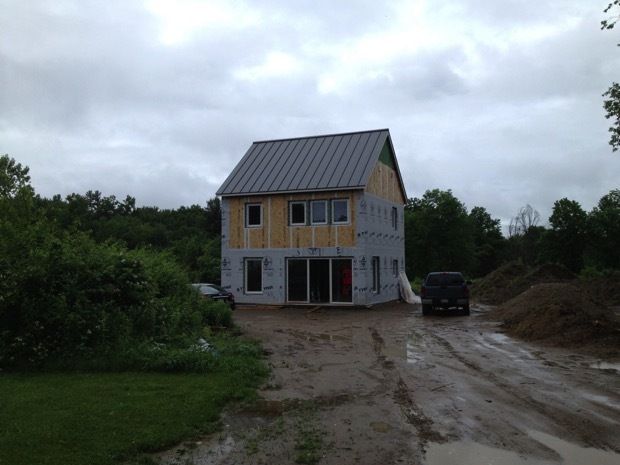 I was glad that the appearance of the outside began to change as the siding went up. I was worried that my neighbors were thinking that I had run out of money. Inside, as soon as the primer went up, you began to get a sense for how bright and wonderful the interior of the home would be. For some reason, covering up the grey drywall with white paint changed the feel in a remarkable way, almost from a dingy prison cell to a wide open modern museum. 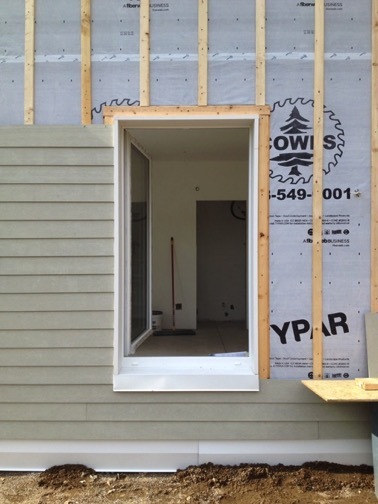 There’s something satisfying about siding — so perfectly straight and even. Neighbor Jesse commented that British scientists could calibrate their standard reference length of a meter off of how perfectly the siding is spaced. The drawback is that the siding is taking forever: measure a piece, cut it, try to fit it in place, measure it again, cut it again, try to fit it in place again, repeat. I can’t imagine how this is going to work when they have to climb up and down a ladder for every cut. I was feeling busy so I figured I would save myself the trouble and just go with GO Logic’s standard interior color. After all, they are the experts. I knew something was wrong when I saw the paint on the wall, but I waited a day to see how it would look after a second coat. By the time I got a chance to take a look at the color again, the whole upstairs had been painted in the most disturbing tint of white that has ever been observed by any human in the history of humankind. The painter Jeff was crying with the paint brush in his hand, it was that bad. A strange green tint would appear at different angles, under different lighting, and trick you into thinking that the walls were actually green. But then you would look directly at the wall and it would innocently switch to a perfectly white looking white, just to mess with you. I ran to the paint store and discovered that every single white paint swatch looked exactly the same — no weird green tints, just white versus white versus white. By scrutinizing the colors inside, outside, in the sun, in the shade, I finally arrived at Mountain Peak. For comparison, I also took a can of Butter Pecan, which my parents have at their home. 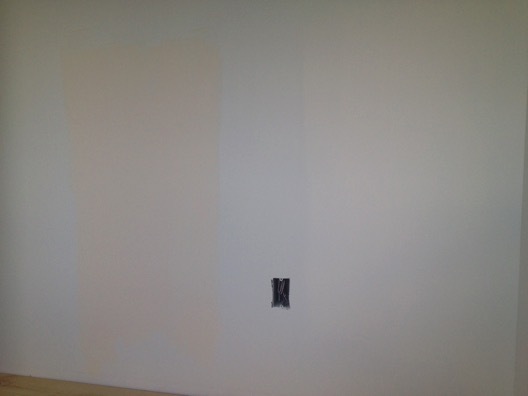 Once the colors were on the wall (above), it was clear that Mountain Peak was perfect, Butter Pecan was slightly too warm and Oxford White was to be avoided at all cost. In the end, it worked out and Mountain Peak turned out to be a wonderfully rich and creamy white, with just enough warmth to make the inside feel welcoming, yet bright enough to make it feel expansive. The lesson learned is that it is a good idea to pick out a set of colors and paint them on the wall before (a) buying all the paint upfront and (b) painting everything before getting feedback on the color. There was one final lesson to be learned, however. I was super happy with the color choice until I noticed that the smell from the paint upstairs was quite strong. I’ve been extremely careful to avoid finishes that off-gas, and so I specified Ben Moore Natura, a zero VOC paint. The paint guy gave me all the paint in a box, I paid for it, delivered it to Jeff the painter, took off, and the next time I returned the upstairs was all painted. Somehow I ended up with the normal paint, not the Natura, and there was nothing I could do about it after the fact. So much for the healthy home thing. 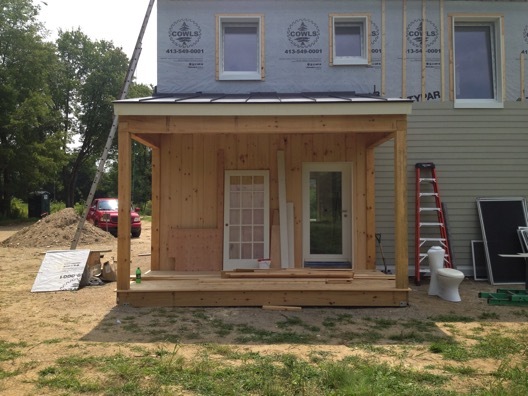 Week 30 - Best back porch ever! The back porch got started last week. 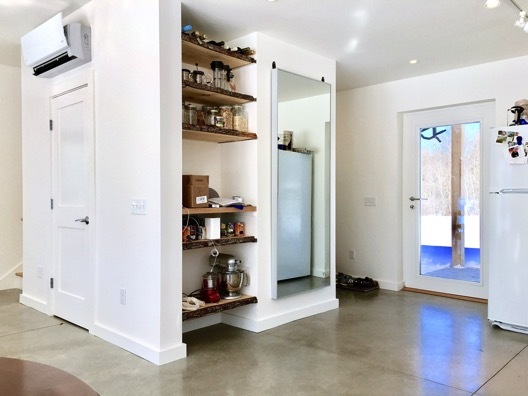 Seemingly added on as an addendum at the last minute, it’s already one of the best features of the home. Most people assume that the main entrance is through the front main windows, but in fact it’s through the back side of the house. Hopefully the wrap-around driveway will clarify this in the future, directing you to the back porch which serves as a visual cue to the entryway. The wide beams seem like overkill, but, aesthetically, something is so satisfying about their proportions. The siding — vertical slats of channel rustic lap siding — also seems like overkill. It is a lot of wood (pine), but it is beautiful, and somehow makes the porch feel like less of an outside space. The beams and the paneling will be coated with a natural sealer and the cedar deck boards will be left to age naturally. Tim Copinger and his crew stopped by to install the standing seam metal roof on the porch, so I got to see the process up close. 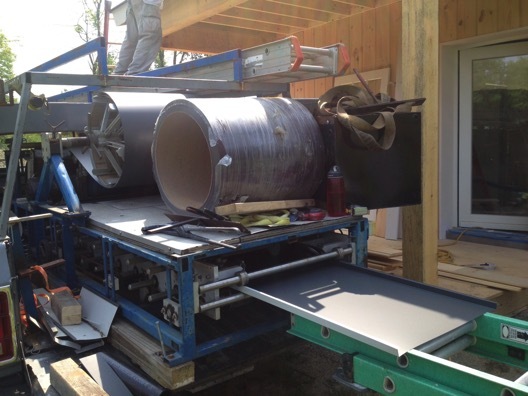 The truck in the foreground has a giant machine that produces each metal sheet one by one, supply them right as the roofers install them. The spool of Galvalume (an aluminum zinc alloy) on top feeds through some sort of mechanism that rolls out the metal sheets, bends up the edges, straightens out the sheets and automatically cuts them to size. It was neat to watch. You can see the flat piece emerging at the bottom right. The seams of each roof panel fit together and conceal a third piece, a clip. 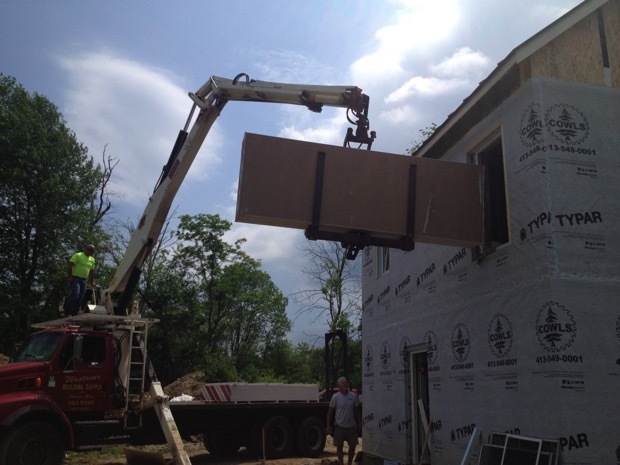 The clip fits under the panels and gets nailed to the plywood, and serves to keep the metal panels attached to the roof. Water can’t get through the seams to the clips so there’s no screw hole in the panels themselves to leak or require sealing. It’s a clever system. So much for my plan to update the blog every week. Ive been super busy, but at the same time the project slowed down to a crawl, so Ive bunched up the past month and a half into a single post. The builder had other jobs. We were waiting for this and that. Sadly, carpenter Don came down with lyme disease, but hes doing better already after a round of antibiotics. 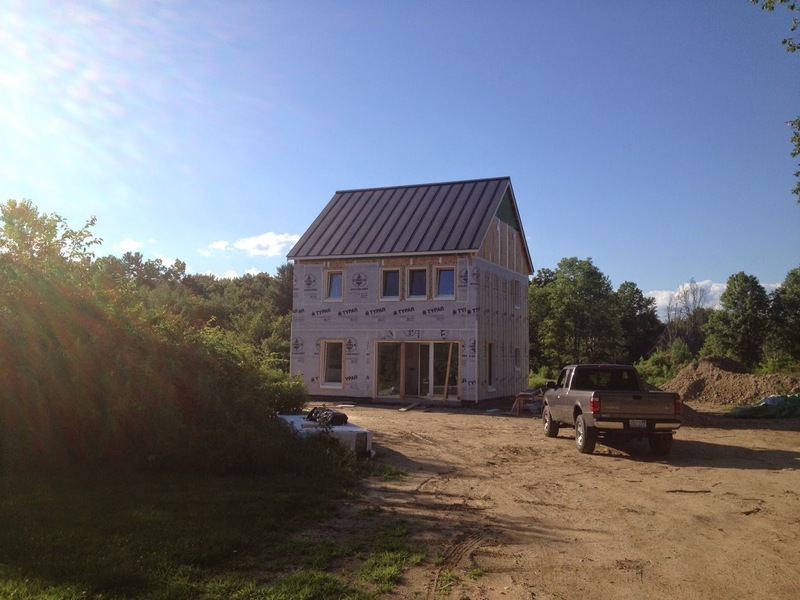 After a month and a half, we got the roof on (1 day), the blower door test done (2 hours), the rough plumbing and electricals (3 days), the insulation (3 days), the drywall mostly up (1 week) and the exterior window framing mostly done (lots of time). 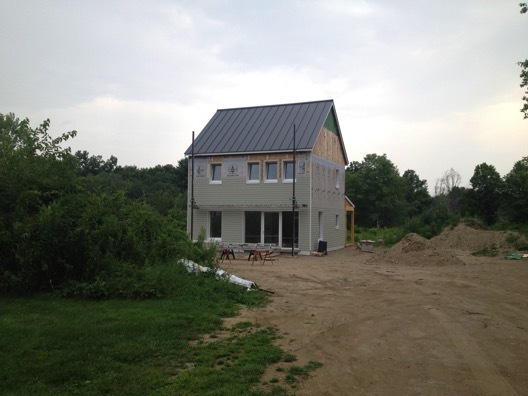 At first, the standing seam roof looked amazing, with a deep rich grey color and thin sleek seams widely placed apart. I was glad we went with the more expensive 24 gauge steal which is thicker, formed in the field, and doesnt have the more industrial looking ribbing. 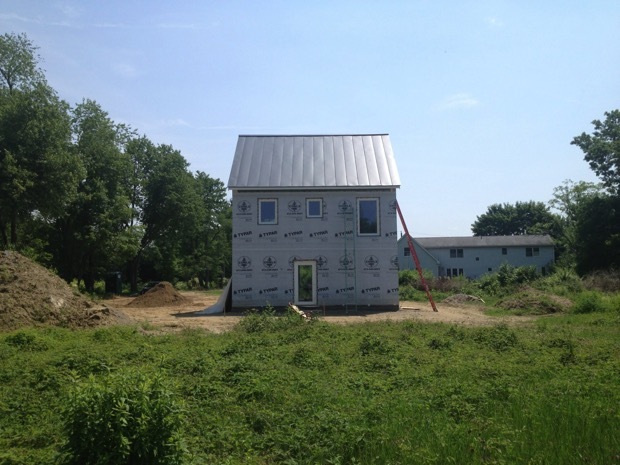 But then I noticed that when the sun is high up in the sky, which happens to be a common occurrence, the roof material looks like a tin can about to crumple – kind of a cheap look for an expensive roof. 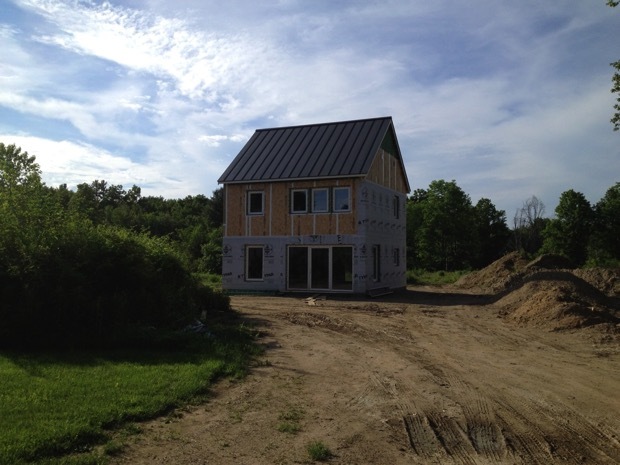 Apparently, this is a common occurrence with standing seam roofs, a trade off for the extra durability and sleek look. By and large, the roof looks great from almost every angle, just not from the road during midday. 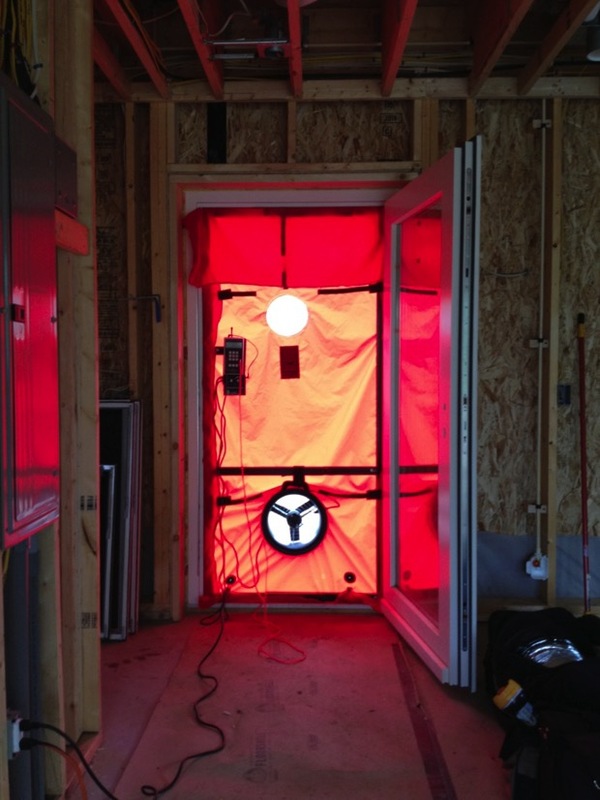 The blower door test is like a baseball pitchers earned run average (ERA), its the ultimate measure of the builders prowess. Everyone was anxious about how the test would turn out. A critical part of the passive house concept is to seal the envelope of the building in order to prevent hot air from seeping out, and to avoid drafts of cold air from seeping in, which tends to be unpleasant in the winter. To verify the degree to which the house has been sealed up, we need to measure the flow of air passing through all of the little unsealed cracks in the envelope. To do this, we replace the front door with a fan and use it to blow air out of the house, and then measure how much air passes through the fan. The flow of air passing through the fan must be equal to the flow of air through all the little breaks in the envelope; there is no other place for the air to go. Presumably (Im guessing here), the fan is calibrated such that the air flow can be determined from the fan speed, at a given pressure between the inside and the outside. 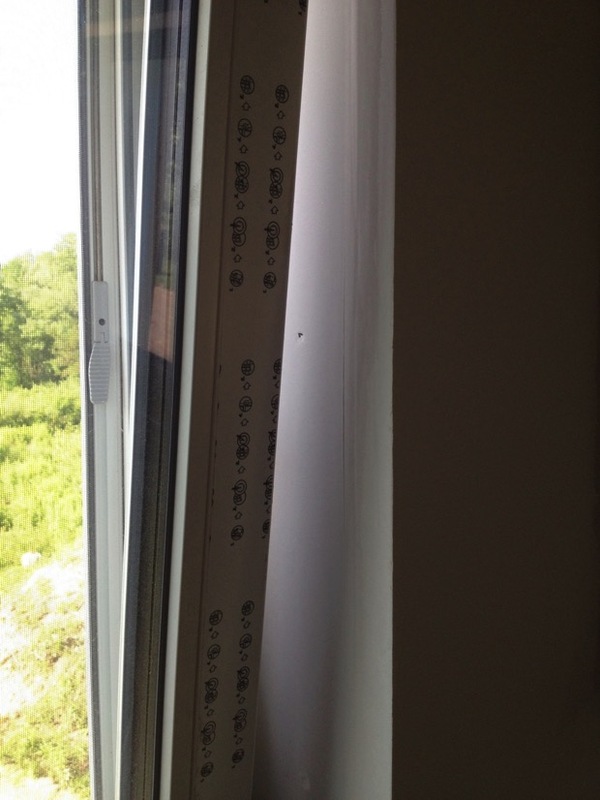 The measured flow is not necessarily the real air leakage, however. The standard pressure used is 50 Pascals, which is substantially greater than you would normally get from wind or your ventilation system, but it serves to make sure everyone is testing under the same conditions. We hooked everything up and started measuring the flow, then ran around the house feeling for drafts to plug up. 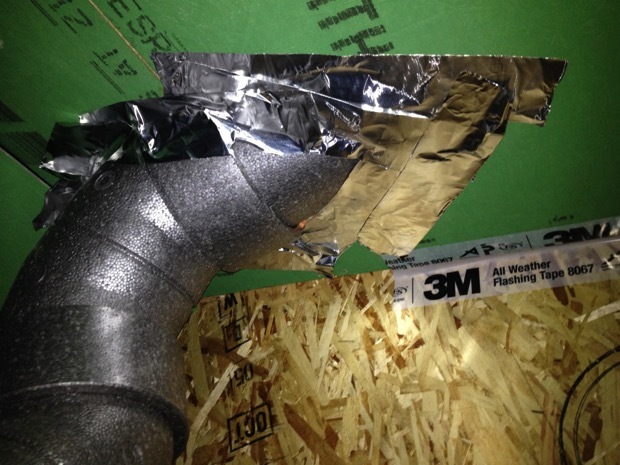 We found a couple of spots in the attic around the HRV where the exhaust and inlet ducts penetrate the air barrier. It seems that the HRV got positioned too close to the wall so it was difficult to tape around the duct adequately. Also, the angle at which the ducts cross the sheathing is not ideal. Its always tough dealing with subcontractors: they dont have much interest in making sure the air barrier will be easy to seal. After plugging everything up, we got a final flow measurement, in units of cubic feet per minute (cfm). The certification guy (Mark Newey, of CET) then calculated the number of "air changes" per hour, meaning the fraction of air that would leak out of the house during an hour, arriving at 0.23 ach at 50 Pascals, an unbelievably awesome number! 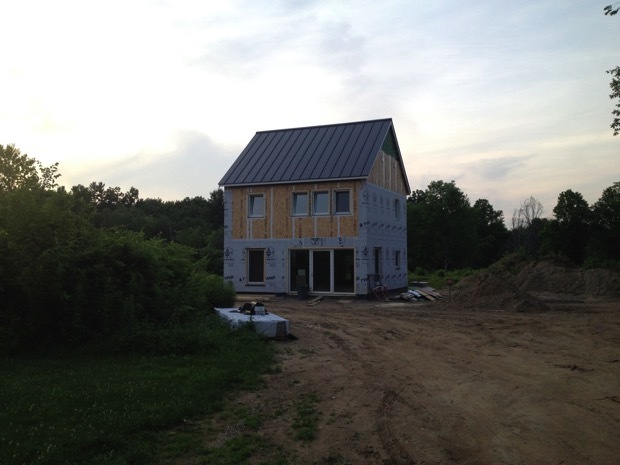 The passivhaus target is 0.6 ach and almost nobody gets down near 0.2 ach. We high-fived each other and went home. Only later — when I relayed the information to the architect — did we realize that we were using the wrong number for the volume of the home. In reality, the result came to 0.34 ach, still an excellent number and a huge testament to the amazing craftsmanship of Don the carpenter and the rest of the Integrity team. 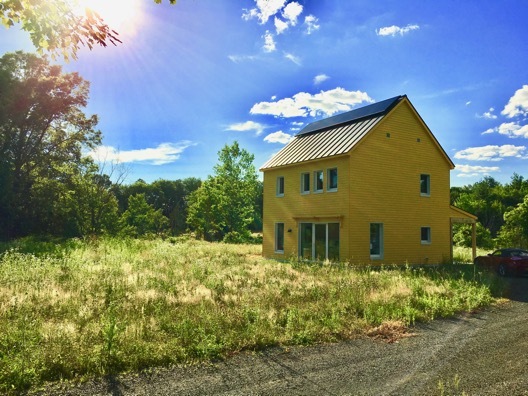 At the last minute, GO Logic was running through their heating demand calculations and realized that the home wasn’t going to meet the 15 kWh/m2 per year goal set by Passivhaus. 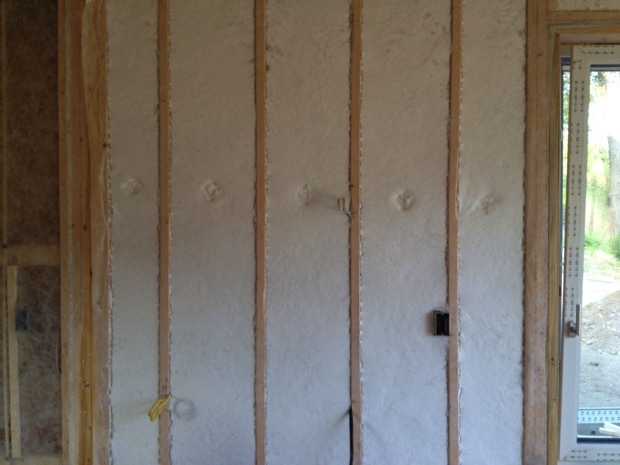 We decided to increase the thickness of the inner stud wall from 4" to 6" and to use blown-in fiberglass instead of blown-in cellulose, for its better R value. Cellulose is often recycled, but there is some concern about the fact that it is treated with chemical fire retardants, so I was glad to not have to worry about that. 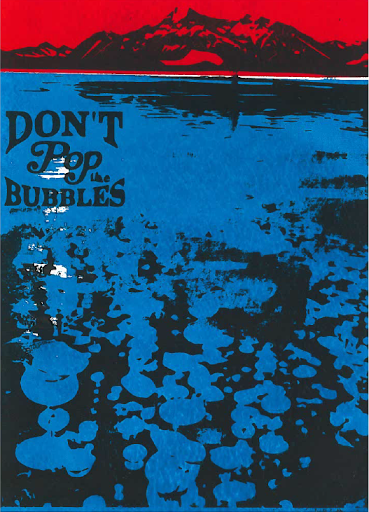 The fiberglass is made of recycled glass and does not need to be treated with fire retardants. The first step is to put up a mesh consisting of a teflon paper type material. The fiberglass is blown in through holes in the mesh until the stud cavity is completely filled and the fiberglass is compacted, creating a interesting artsy wall with a quilted look. To keep the mesh from bulging outward, it is stapled at the studs, which makes for a cool stitch pattern. Too bad the walls are going to get covered with drywall. 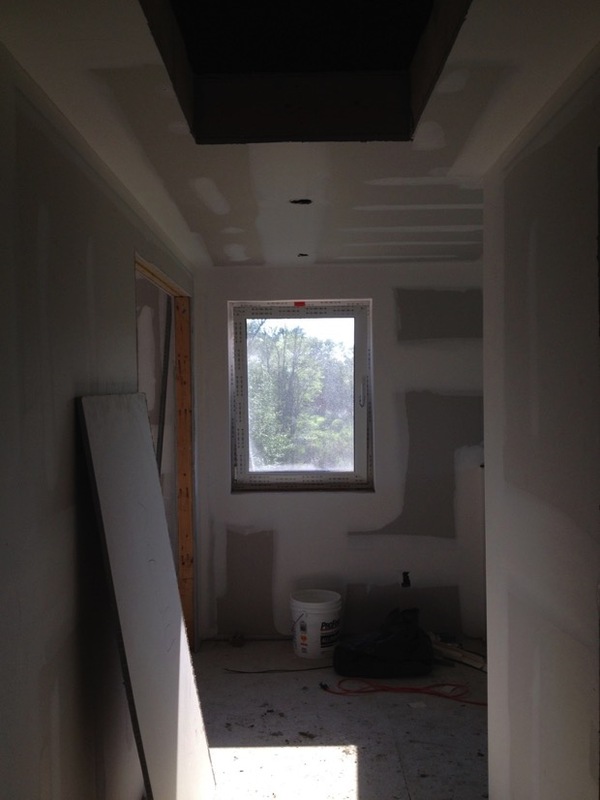 Week 25 - What’s the purpose of drywall? No offense to the drywall crew, but drywall strikes me as completely useless. The amount of material used is enormous. It’s bulky and heavy and takes forever to install. It uses up space and, after it was installed, it made the rooms feel smaller. Why not just tack up a thin panelling material? 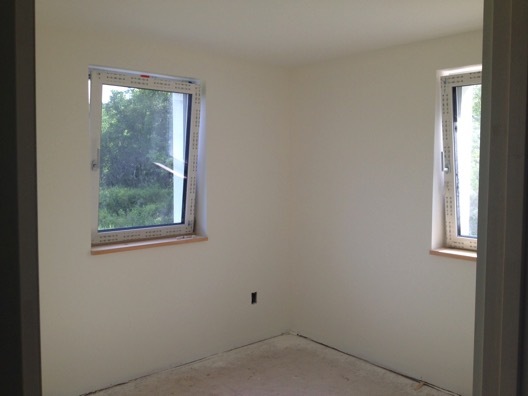 It’s a good thing we enlarged the window to the stairway, and also good that it’s an operable window, otherwise it would have been impossible to get the massive drywall panels upstairs. Passing them through the window was still a major exercise. There must have been four or five loads, each as massive as the one you can see in the image above. 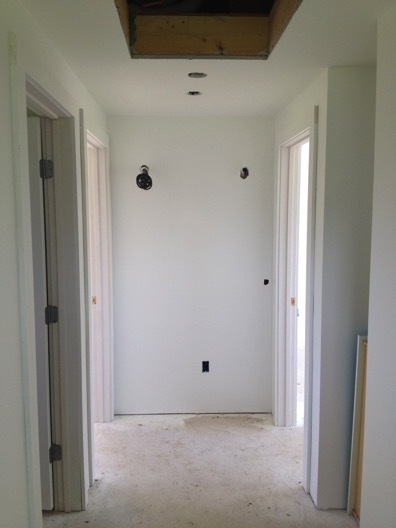 The drywall really makes the rooms feel closed-in and small, but apparently once the rooms get painted they open up again. I’m keeping my fingers crossed. Finishing the drywall took one guy over a week, being careful with the corners and sanding down everything nicely. The upstairs hallway is starting to feel like a super nice spot in the home. 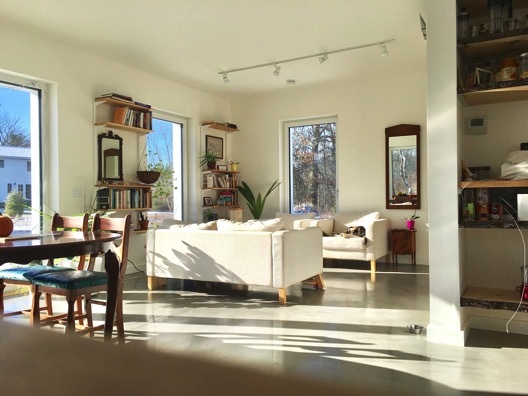 It feels luxuriously large for a small home — almost too large — but I think we made the right decision to keep it big. For a while I played with tightening up the hallway to give more room for the bedrooms. In the end, the bedrooms indeed came out tiny, but that’s fine. For someone like me who struggles with insomnia, you want to keep your bedroom for sleeping, a dedicated space without distractions. The hallway, on the other hand, gets a lot more usage and impacts the feel of the home in a greater way: it’s your first impression as you walk up the stairs and it’s a common space that gets a lot of traffic. 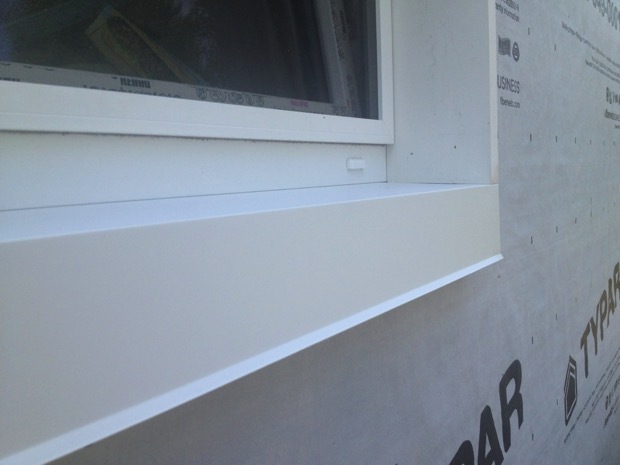 Here’s a look at how sharp the drywall edges came out, which really helps give the windows a crisp modern look. Most of the week was spent finishing the window frames, a long and arduous process that seems to have taken 99% of the time spent building the house. 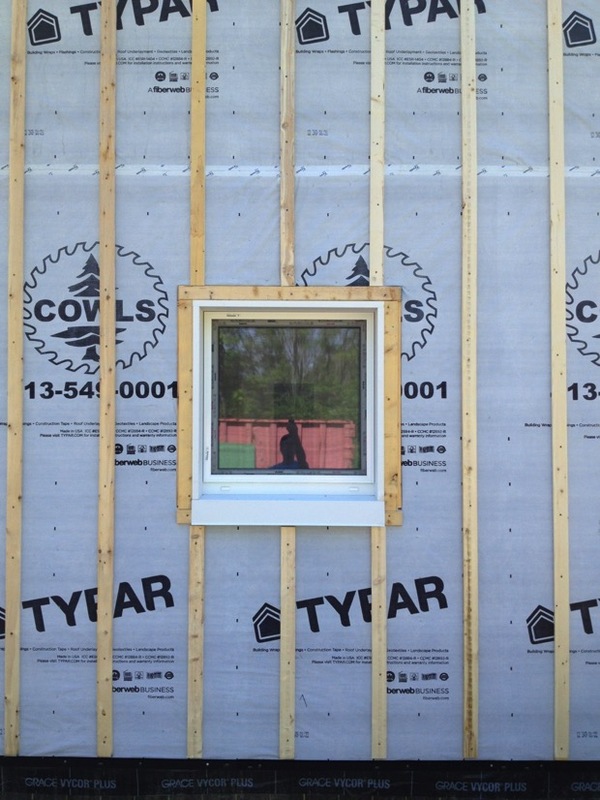 I’ll have to write a dedicated post in the future describing the window framing. Each window required so much measuring and cutting and fitting things together — it’s like building a delicate piece of furniture, but the piece is hanging one story up in the sky and you need a ladder to access it. 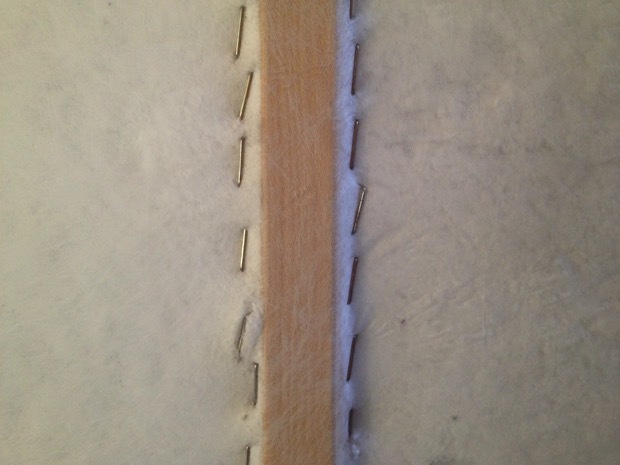 The aluminum flashing was formed by Don in the field and careful cut and wedged into place. Here’s a shot of the spacers that will keep the siding offset from the walls. 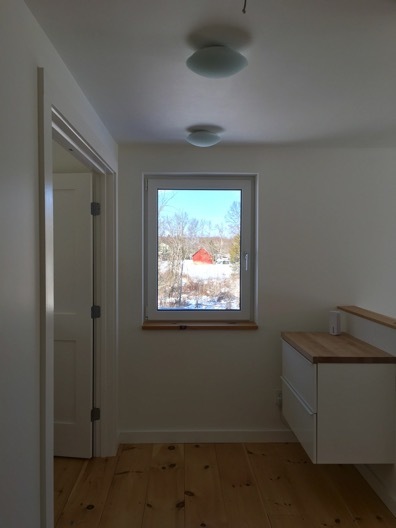 The little gap between the siding and the wall allows air to flow from under the siding up into the space just below the roof, rising at it warms up and serving to prevent the buildup of moisture that can lead to rotting. Be sure to check out the photostream for more detailed images (with captions) of whats been happening. At the moment, however, the photostream is down, but hopefully Apple with have it back up soon.